The future of dry van trailer tracking is here. Over the next five years, billions of everyday objects, including trailers, will transition from ‘dark, dumb and disconnected’ to ‘visible, smart and connected’ thanks to Internet of Things (IoT) and telematics technology. 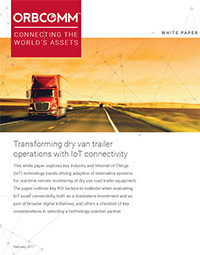 This White Paper explores key industry and IoT technology trends driving adoption of telematics systems for real-time remote monitoring of dry van trailers.